Welcome to my first review in a long time! I’ve been busy with other endeavours, including a day job and ventures into unknown areas of art, but I’m still on my grind. This review was made possible by the folks at The Minifigure Store, who were kind enough to send this item my way last week. Please go and check them out, and you can also purchase this item from them! 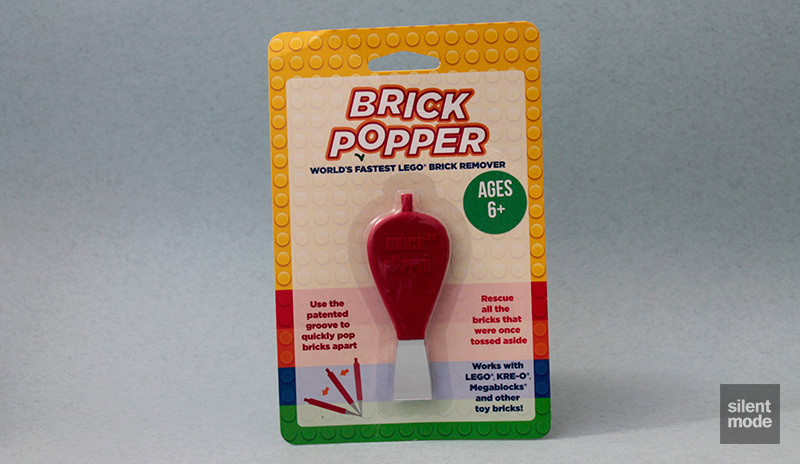 Introducing Brick Popper, along with the bold claim that it’s the “World’s fastest LEGO® brick remover!“ on the official website. It’s an alternative to LEGO’s brick separator (whether you prefer the older chunkier version, or the newer version with the axle remover). Though LEGO appears in the tagline, Brick Popper is also targeted towards fans of other companies and their similar interlocking parts. On first glance the Brick Popper looks like a cross between a screwdriver and one of those big squeezy pipettes often used in photography… and it just so happens that a reference to knives – as well as other instruments we’ve probably used back in the day – is on the back of the packaging, together with some brief instructions. By the way, the packaging is a printed sheet of cardboard with a plastic shell for the tool. You could definitely see this item in your toolbox, as it very heavily resembles a screwdriver rather than something you’d use on plastic toys. In any case: the Brick Popper appears to be a securely attached two-part item, with the head of the tool made of some kind of metal, and the handle a hard red plastic. The screwdriver-like head is obviously the bit you’d use to separate parts from each other, while the handle provides a convenient axle-shaped appendage for poking axles out of holes. 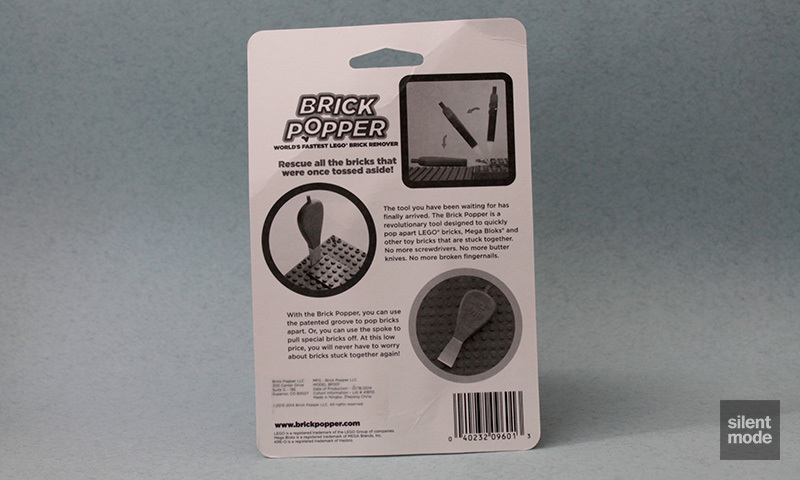 The Brick Popper logo is also embossed on one side of the handle. It would also be nice if there was a hole for attaching it to a keychain or something. LEGO’s brick separators don’t have one, so I guess it’s a moot point. Is the Brick Popper the world’s fastest LEGO brick separator? Well there’s no better way to put it to the test than to place it in the hands of an ageing, decrepit fossil of yester-century. As with any new tool, it took a while to get used to the lever action of the Brick Popper, being used to the gripping action of LEGO’s own brick separators and, on occasion, my own fingers. All we have to remember is it works just like a flat head screwdriver! Just place it behind the brick or plate you want to remove, and use the tool to lever the part until it comes off. The process worked okay, as soon as I realised that using the studs behind the tool for leverage helped a lot. It usually takes two or three goes to lift a part from another enough to remove it (I used plates in this demo), but best of all there are no teeth marks or visible damage to speak of. I then went on to try removing these parts from the Blue plate in every scenario I could think of, and both the process and ease were the same. The axle remover on the tool worked very well, as demonstrated by removing one of the pins from an axle brick found in the Mixels sets. Hopefully this can also be used with Technic pins, although I don’t see why not – I didn’t have any lying around at the time of writing. The Brick Popper is a solid tool, and I can see it being incredibly useful for mosaic builders (who usually have to deal with goodness-knows how many plates) and anyone digging out their old LEGO collections. It’s always good to see someone taking a novel approach and putting something different into the marketplace. Though I don’t think there was any suggestion, the Brick Popper definitely isn’t a replacement for LEGO’s brick separators. It seems to specialise in quickly removing parts from baseplates, and because of the relatively thick head it won’t help you separate bricks or stacks of plates from each other. I would say that removing axles (and possibly pins) is much faster with this tool than LEGO’s new separator, just because of the handle shape. I do think a trick was missed by not having a hole to place this on a key chain or something similar, but in the end I would recommend having one of these as part of your LEGO building arsenal, if you can get one. I’d be content with giving this tool a 7.0 out of ten.